Fiat, founded in July 1899 in Turin, Italy, is one of the world's 10 largest car companies in the world. Giovanni Agnelli is the founder of Fiat. Fiat is the first manufacturer of subcompact car in the world. FIAT is the abbreviation and transliteration of the company. FIAT is also the trademark of the product. At present the brands under Fiat include Fiat, Ferrari, Alpha, Romeo, MaShaLaDi, etc. Fiat wheel rim adopts the front drive mode. The former brake and the disc brake are used together. 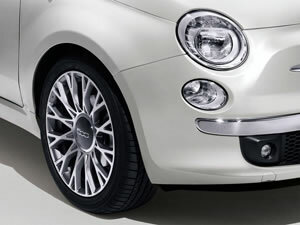 This car wheel rim for FIAT is made of steel. Wuxi Hengsheng Wheel Co., Ltd is a professional FIAT style steel wheel rim manufacturer and supplier in China. In addition to FIAT style steel wheel rim, we also provide other famous models steel wheels (rims) for our clients around the world, like Ford wheel (rim for Mercury), Geely wheel (rim), Honda wheel (rim), Hummer wheels (rims), HYUNDAI wheel (rim), Infiniti wheel (rim), JEEP wheel (rim), Kia wheels (rims), Lexus wheel (rim), etc. We possess a professional technology team to guarantee the manufacturing of FIAT steel wheel rim. We will checkout all the products and give out a survey report. According to the needs of every client, there will be a dynamic balance sample survey among parts of the qualified FIAT steel wheel rim.